At the tender age of 19, France striker Kylian Mbappé is already compared to sport's greatest. His two goals in France's 4:3 win against Argentina in the FIFA World Cup's Last 16 last Saturday marked the first time since 1958 that a teenager scored twice in a World Cup match – 60 years ago it was no one less than Pele, then 17, who netted twice in Brazil's final against Sweden. Also in the Argentina match, in the sprint that eventually saw him being fouled in the box, with a penalty awarded to France, he ran as fast as 38km/h. That's faster than 'the world's fastest man', Usain Bolt, ran on average in his world record 100m sprint (9.58 seconds) at the 2009 Athletic World Championship in Berlin. With a transfer sum totalling 180 million euro, he has just become the second most expensive football player, with only Brazil's Neymar, who, just like Mbappé, plays for Paris Saint-Germain, being more expensive (222 million euro). With the eyes of the world being firmly on the 19-year-old ahead of France's quarter-final at the FIFA World Cup this Friday, a little less known is the fact that there are plenty of handball genes in Mbappé's body. 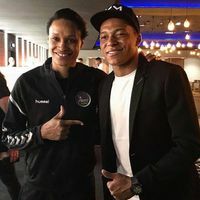 Swedish handball channel, Handbollskanalen, already mentioned last year that Mbappé's mum is former handball player Fayza Lamari, who played for AS Bondy in the first league in the late 1990s. His father played football in Bondy, a suburb of Paris, north-east of the city centre. “She was a symbolic figure of the handball club of Bondy,” Jean-Louis Kimmoun, former board member and then club president, told 'Le Parisien' in March last year. Despite the buzz and hype surrounding him, Mbappé at first glance remained a down-to-earth Bondy boy. All the bonuses he earns at the Russia World Cup, he will donate to 'Premiers de Cordee', a charity organising sport events for disabled children. And he has not forgotten about his handball background either, bumping into French international Allison Pineau and happily posing for a quick photo with the Brest Bretagne Handball centre back.